Bicycles harness the power of your muscles and convert more than 90% of the energy delivered into the pedals by a cyclist’s legs into kinetic energy which spins the wheels. A person walking requires 60 watts to walk 5 km/h. On a bicycle, that same person can average 15 km/h. The differences get more dramatic if you’re running: world class racers can produce up to 25 watts of energy allowing them to travel at 50 km/h (and only briefly). However, the fastest human powered vehicle, a streamlined recumbent bicycle, reached an astounding speed of 133.78 km/h. Yet this amazing tool has a somewhat unknown history. The history of the bicycle is long and its effect on society cannot be overstated. Beyond locomotion, the bicycle has had a proud impact socially. Learning how to ride a bicycle is a major milestone of childhood– the first taste of freedom, travel, and adventure. 200 years ago most working class people – especially in the countryside (where most lived) never travelled more than few miles from home. People married close neighbours and the longest trip was by foot to the nearest market. The idea of travelling 50 kilometres was as much an event as for us to fly across the world. Stagecoaches were slow, uncomfortable, dangerous and expensive and something few could use. Leisure horses (as opposed to ‘working’ horses) were a luxury item of the rich. Then came the railway revolution, when suddenly even relatively poor people could travel – even if it was rarely possible to do so. But this huge revolution was overshadowed by the introduction of practical bicycles that many could afford. Suddenly if you wanted to travel 50 kilometres in a day, you could. If you needed to get water from a well which was a far distance from your home, you could. Not only that, but unlike the railways you could travel when and where you wanted and at effectively zero cost. So suddenly, education became available for many that simply couldn’t have reached it before. The impact that the bicycle is having in many poorer parts of the world such as South Asia, sub-Saharan Africa and South America is comparable. At a stroke the ‘common person’ becomes almost infinitely mobile – the limitations of how far you can walk in a day are swept away and larger social networks and job mobility become possible. “Wheels of Change” is one of many charitable organisations which provides bicycles to various places in Africa with the aim of improving living conditions, reducing poverty, improving access to health care, education, potable water, and combatting climate change. It could easily be argued that this bicycling revolution was more important to the development of the working class in the UK than the coming of the railways. Cycling has also served the noble purpose of advancing equality among the sexes (which we shall see in part 2) – and yet this massive impact is now largely forgotten. But how did we get to the bicycle that we know and love today? What were early bicycles like and how practical were they? Like many of the tools we depend on, the bicycle has a simple practical beginning. The first contraption that can realistically be said to resemble a bicycle was constructed around 1790 by Comte Mede de Sivrac of France. Called a celerifere, it was a wooden scooter-like device with no pedals or steering. When using the celerifere, the rider is perched on a seat between two wheels similarly sized wheels, and using their feet to propel the bicycle like a scooter. This bicycle could not be turned and could be driven only straight. 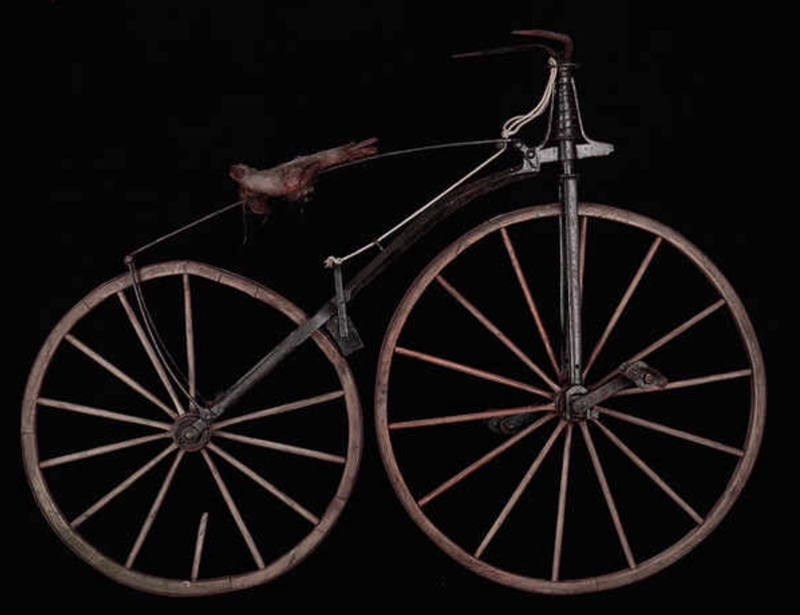 This first bicycle was a revolutionary machine in that it was probably the first single rider machine not pulled by animals. The celerifere was not very popular though. It was very hard to use and many people did not try to use it for fear of accidents. There were no handlebars and so people used strings tied to the front wheel. There were no pedals or steering system. Hence people have to use their feet to drag it along the road and it was very expensive, costing nearly as much as a horse. The inspiration for the invention of the bicycle as we know it today came about in 1816, during the “Year Without a Summer” also known as “Eighteen Hundred and Froze to Death”. In what historian John D. Post has called “the last great subsistence crisis in the Western world”, a giant volcanic eruption of Mount Tambora in Indonesia in 1815 caused a worldwide agricultural disaster and famine. Startling numbers of horses began to die throughout Europe, and the German inventor, Baron Karl von Drais, set out to solve this crisis by constructing a wooden machine with two wheels and a frame that a seated rider could straddle and propel with their feet on the ground as if running. It improved upon the celerifere by introducing handlebars and a steering mechanism attached to the front wheel. His machine was commonly known as a “Hobby horse” or a “mechanical horse“, but it was known in various circles as a “Draisienne” or a “Laufmaschine” (running machine). To 19th century eyes (and admittedly to our modern eyes), this contraption would have looked utterly ridiculous with the rider’s legs flailing about everywhere, and at first, very few people except the eccentric rode these machines. 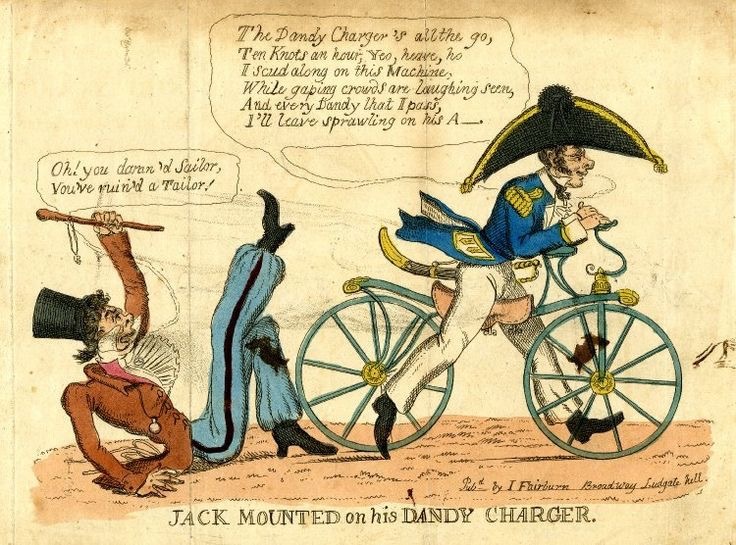 So hobby horses were also satirically named “Dandy Chargers” due to the prevalence of dandies (early hipsters) wearing their ridiculous clothes while riding their weird, brightly-painted wooden contraptions. For the next hundred years or so different manifestations of this human-powered machine would come and go, each one advancing the bicycle to become a more rideable, and useful machine. 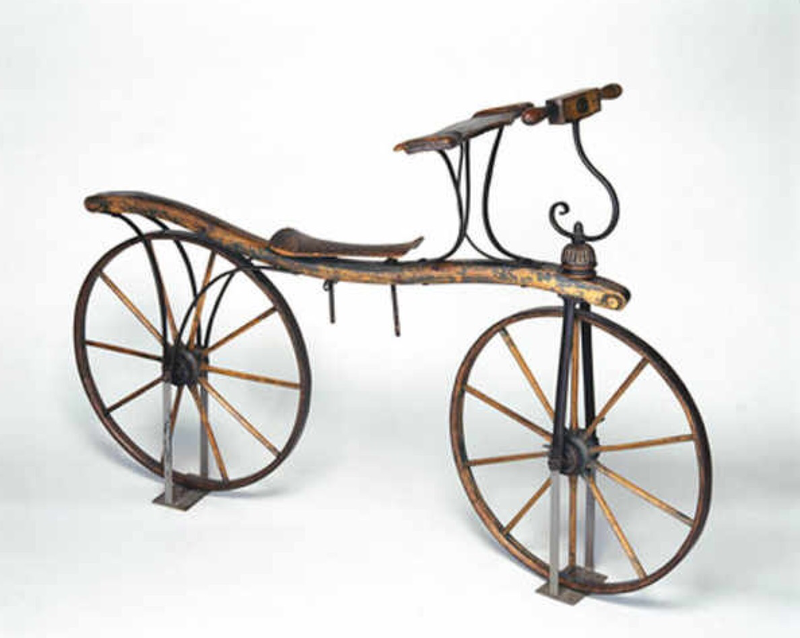 In 1861, two French brothers Ernest and Pierre Micheaux first thought of fixing cranks and pedals to the front of an old hobby horse bicycle. This made it faster and brought the rider’s feet off the ground for the first time. The Micheaux brothers attached pedals to a cranked arm, which would then propel the front wheel. Just like the hobby horse before it, it had wooden wheels and wooden spokes, but the invention of pedals allowed the rider’s feet to leave the ground. 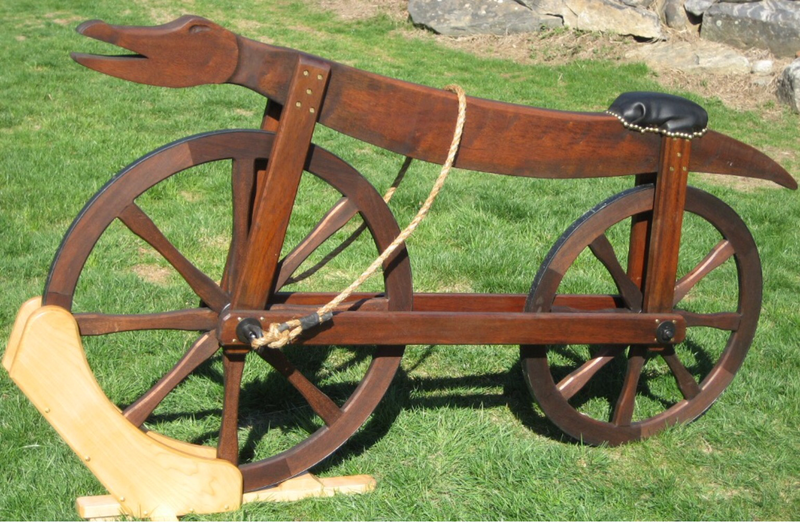 The earliest of these cycles had horizontal frames like the hobby horse, but later machines used downwards curving frames joined to the rear axle. On both types the seat was mounted on a separate wooden or metal spring. This made the seat more comfortable but the wooden wheels and iron rims caused the handlebars to shake when riding down cobbled streets, hence the name ‘boneshaker’. In 1869, Frenchman Eugene Meyer invented the wire-spoke tension wheel in 1869 and produced the classic high bicycle design. English inventor James Starley, regarded as the father of the British cycling industry, began making bicycles based on the French boneshaker but with front wheels of increasing size in order to allow greater speeds. Ball bearings, solid rubber tires and hollow-section steel frames became standard, reducing weight and making the ride much smoother. The old “boneshaker” quickly went out of fashion. In the days before drive chains, the pedals were connected directly to the wheel meaning that the wheel turned at the same speed as you pedalled just like a modern “fixie” bike. To modern eyes, the huge front wheel looks ridiculous, but without a drive chain, the old boneshaker was very slow with its direct pedalling combined with tiny wheels. It was soon realised that the larger the wheel, the greater the speeds that would be reached. However, the size of the wheel was limited by the rider’s leg length. Just like a fixie, there was no ratchet system built into the hub allowing for coasting, so if the wheel spun, the pedals spun along with it and going fast down a hill your legs kept spinning wildly. Penny farthings were fast, but extremely unsafe. The rider was high up in the air and traveling at a great speed. If the rider hit a pothole in the road they could easily be thrown over the front wheel and be seriously injured. This is still a very common problem with modern fixie bikes. Broken wrists were common in attempts to break a fall. “Taking a header” (also known as “coming a cropper”), was not at all uncommon. The rider’s legs were often caught underneath the handlebars, so falling away from the machine was often not possible. 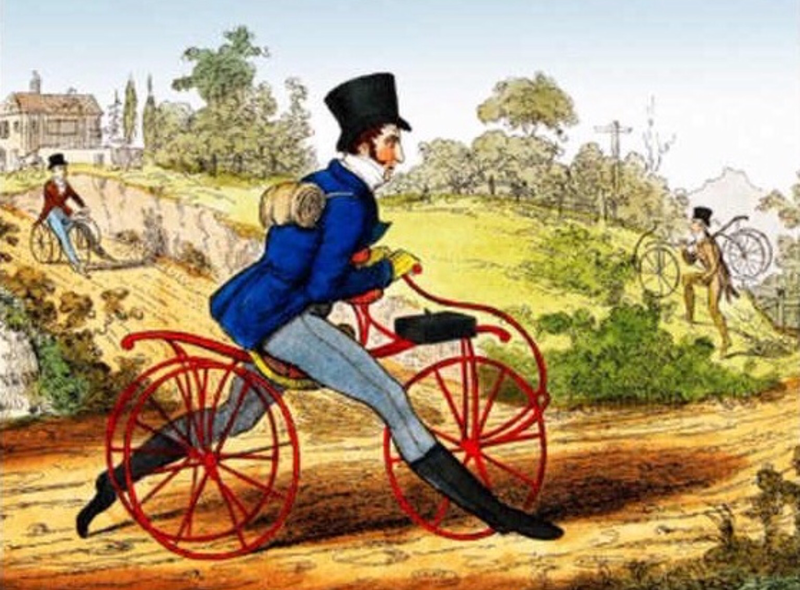 The dangerous nature of these cycles (as well as Victorian sensibilities) made cycling the preserve of adventurous young men. The risk averse, preferred the more stable tricycles or quadracycles. In addition, women’s fashion of the day made these cycles inaccessible to them. 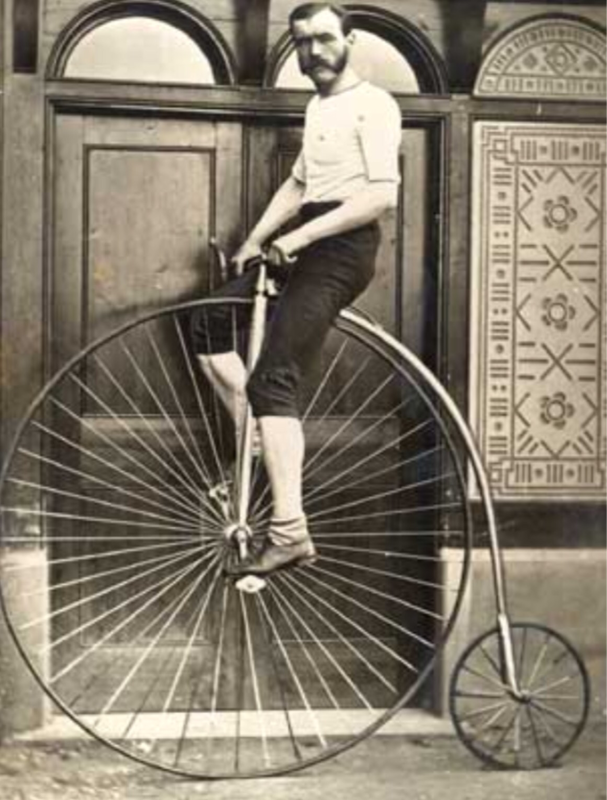 Although we know know it as a “penny-farthing“, that term was not used until long after this machine was outdated. The first recorded print reference is from 1891 in Bicycling News and it comes from the penny and farthing coins used in Britain. At the time they were simply known as “bicycles” and were in fact, the first machine to bear this name. In the late 1890s, people began to use the name “ordinary“, to distinguish them from the emerging safety bicycles. They are often also known as “high wheelers“. Although the trend was short-lived, the penny-farthing became a symbol of the late Victorian era. Its popularity also coincided with the birth of cycling as a sport. Aside from the obvious safety problems, because the penny-farthing’s direct front wheel drive limited its top speed, a new invention was necessary that changed the appearance and efficiency of the bicycle in a revolutionary way. John Kemp Starley, James’s nephew, produced the first successful “safety bicycle”, the “Rover,” in 1885, which he never patented. It featured a steerable front wheel that had significant caster angle and a drive chain leading to the rear wheel which allowed the wheels to be equally sized again. This gave rise to the bicycle shape that we are familiar with today. In a way, the invention of the drive chain reverted the design of cycles back to an earlier time. The chain and gear system allowed the same amount of force to be applied with a greater energy efficiency. Incidentally, Leonardo Da Vinci had invented a chain driven gear in 1490, but it is unlikely that he applied his gear to a bicycle-like machine. 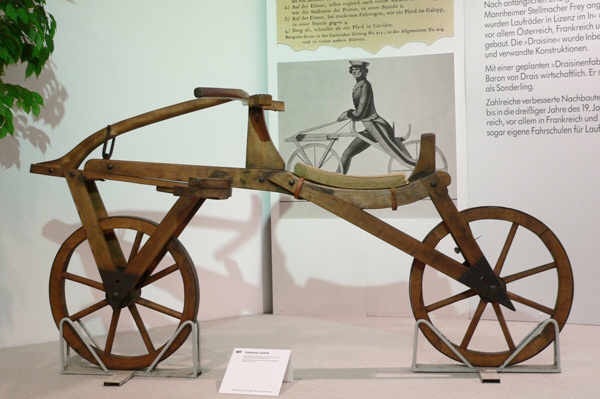 Several drawings were found purporting to be of a bicycle designed by Da Vinci, but they are widely considered fake. However, Da Vinci’s drawings for the chain and gear system seem to be real though, although they would have been made of wood. The safety bicycle completely replaced the high-wheeler and Irish inventor John Dunlop‘s invention of the pneumatic bicycle tyre in 1888 made for a much smoother ride on paved streets. However, the tyre was glued directly to the wheel. 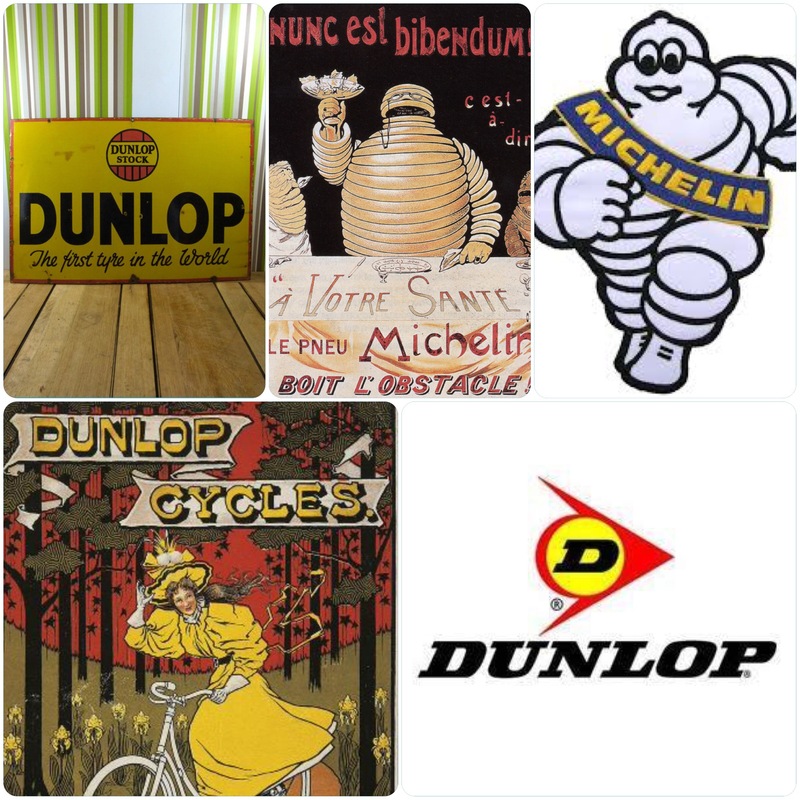 In 1889, French brothers Édouard and André Michelin invented a detachable type that could be replaced when necessary. The companies founded by these inventors still of course exist today. 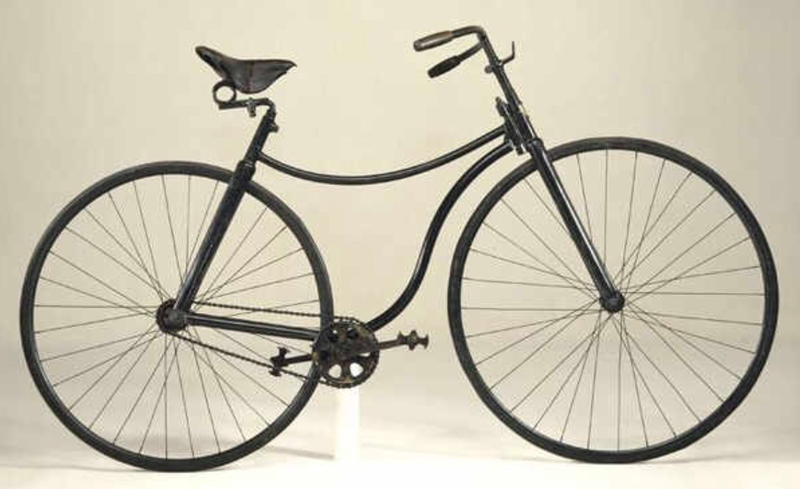 As with the boneshaker, safety bicycles had been much less comfortable than high-wheelers precisely because of the smaller wheel size, and frames were often buttressed with complicated bicycle suspension spring assemblies. The pneumatic tyre made all of these obsolete, and frame designers found the diamond pattern to be the strongest and most efficient design. The chain drive improved comfort and speed, as the drive was transferred to the non-steering rear wheel and allowed for smooth, relaxed and injury free pedalling (earlier designs that required pedalling the steering front wheel were difficult to pedal while turning, due to the misalignment of rotational planes of leg and pedal). With easier pedaling, the rider more easily turned corners. With four key aspects (steering, safety, comfort and speed) improved over the penny-farthing, safety bicycles became very popular among elites and the middle classes in Europe and North America in the middle to late 1890s. It was the first bicycle that was deemed “suitable” for women, and American feminist Susan B. Anthony called it the “freedom machine”. This was the beginning of the “golden age” or “bicycle craze”. In the second part of this series, we will see how the bicycle was instrumental in liberating women from the patriarchic shackles of Victorian clothing, behaviour and attitudes. We will also see how it was a vital tool in helping the suffragettes fight their cause. Love this, looking forward to your next installment!